If we were to make a tier list of video game developers, there’s no doubt in my mind that BioWare would be sat among the very best that the industry has to offer, atop the god tier. There’s a special amount of hype that builds up around any new release that the Canadian developer puts out, and for good reason. For some, it’s their memories of Mass Effect that get them pumped for whatever the team comes up with next, while others might be dreaming of the next fantasy RPG – long understood to be Dragon Age 4 – that's in the works. And if you remember PC gaming before Steam, when CD cases had to be packed in oversized cardboard boxes, then it may well be the likes of Baldur’s Gate, Neverwinter Nights or even Knights Of The Old Republic that you’ll attach the BioWare name to. The truth of the matter is that few developers have the prestige of BioWare. The studio has built a brand that is synonymous with great characters, realistic worlds and intriguing storylines, but that wasn’t always the case. It's funny to think then that, back in 1994, BioWare didn't really have much of a plan – let alone any hope of shaping the RPG genre. The trio challenged themselves to make a game over the summer of '94. If they could do that, they figured, then they would be able to justify quitting their respective jobs and focus on making games full time. Against all the odds, the young game makers succeeded and had managed to produce a game they called Blasteroids 3D. Don't worry if you haven't heard of it. In fact, Trent is pretty upfront about the quality of that first creative endeavour. “It was horrible,” Trent laughs, before detailing the project. “It was DOS-based, 16-bit code. It was the Asteroids game, only it was kind of from a first-person perspective, and it was done just using scaling sprites.” It was never designed to be a commercial product, but rather a “proof of concept” of sorts, evidence that the three could indeed produce something that resembled a video game. It was, however, Marcel Zeschuck’s cousin that would bring the three other founders of BioWare on board. “Greg Zeschuk used to come down every summer, and we used to play D&D together and watch kung-fu theatre and goof off,” Trent recalls, adding that Greg was instantly interested in getting involved with game development when he saw what they were up to. Through Greg came fellow doctors Ray Muzyka and Augustine Yip – the six of them would go on to become the original founders of BioWare in February 1995. We've gone through the heartache of ranking the best BioWare games so you don't have to. That decision was made by Interplay who, by way of an apology, asked if BioWare would like to work on a sequel to MDK since the game’s previous developer, Shiny Entertainment, didn’t have any interest in making another. BioWare agreed though development would be far more challenging than it could ever have anticipated – even if it did set the studio on the path to becoming the RPG behemoth that we know and love today. A first-person mech combat game and a third-person shooter aren’t exactly the facets of gaming that BioWare is recognised for today. But it is here where the foundation for what would come to define BioWare started to reveal itself. In fact, the development of Shattered Steel and the pre-production work on MDK 2 had caused the doctors – the three that remained at BioWare – to come up with something new to work on, in an area that felt more natural to the staff on the team. Initially termed Battleground: Infinity, this was an exploratory project intended to modernise computer RPGs and was headed towards becoming massively multiplayer, built on what would become known as the Infinity Engine. But as luck would have it, Interplay had just acquired the D&D license; An obvious pairing was born. Baldur’s Gate ended up being about as defining a game as a company could hope for. It sold nearly as much as Diablo, propelling the BioWare name into the limelight and, as it would seem, saving Interplay from collapse. But more than that, it set a precedent for what would come to be the defining aspects of the studio: It had great characters, a great setting, and a great story. A bunch of the BioWare classics are coming to a home console near you soon, here's why you should be excited. Despite this growth, some of the founders had already left. Brent had already grown disillusioned with the team during Shattered Steel, while Augustine Yip had left towards the end of Baldur’s Gate's development to continue practising medicine. But BioWare was on course for great things, even if the Baldur’s Gate sequel - and the release of MDK2 - hadn’t done enough to rescue Interplay from bankruptcy. Ultimately, BioWare ended up pairing with Infogrames on Neverwinter Nights (2002), Lucasarts for KOTOR (2003) and, finally, Microsoft with Jade Empire (2005). It's around this period where you could see BioWare going from strength-to-strength, with the studio's output proving that the company had a unique ability to produce deep RPG titles with rich, involving storylines, characters and worlds. It's that reputation that would ultimately help propel BioWare into its most successful period to date. What makes a BioWare game feel, well, like a BioWare game? GamesRadar investigates. At this point, BioWare had already built up a reasonably sizeable reputation as masters of the genre, but it wasn’t until the likes of Knights Of The Old Republic and Jade Empire that it was able to prove just how well it was able to craft a compelling story. The industry was taking notice and, as such, Electronic Arts moved in to purchase the studio in 2007. 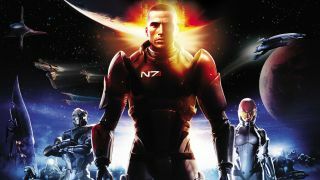 In fact, it made a move just one month out from the debut of one last generation's most influential new franchises – Mass Effect. This game would go on to be a milestone for BioWare. The studio was now able to work on a massive RPG with the scale and scope of a licensed product but with none of the constraints – a dream come true. “Mass Effect was a commitment to make our own intellectual property,” says Aaryn Flynn, who had started at BioWare as a tools programmer on Baldur’s Gate II, later going on to become studio manager at the company. At this point, it’s fair to say that the rest is history. Mass Effect, even with its issues, was a huge success. Its exclusivity as an Xbox 360 title became a huge boon for the platform, and certainly one of the oft-referenced titles in the console war between Microsoft and Sony. But more than anything it made BioWare a household name; The shift away from PC-only development ensured that the developer finally had access to an audience that had previously alluded it. For the first time since the studio's inception a decade before, the world finally discovered the hold BioWare had over the action-RPG genre. Through its growth, BioWare went on to release complete trilogies in both the Mass Effect and Dragon Age franchises, with the skills and quality of the team at BioWare becoming more refined and finessed alongside each new product. And EA’s influence, despite what many would expect, didn’t lead the studio down any paths it didn’t want to take. “Sometimes the budgets felt small, and timelines felt short,” admits Aaryn, adding that this was “definitely the case for DA2”. For all the improvements the developer has made over the years, that’s not to say there weren't any hiccups along the way. Dragon Age 2, for example, had a limited development cycle, ultimately leading to the reused environments and the constrained scope that it was so often criticised for. But it was, of course, Mass Effect 3’s infamous ending controversy that really had BioWare fans beginning to doubt the developer. With the epic conclusion to the trilogy petering out with a starchild and just one of three choices ultimately affecting which cutscene played. It was an outrage, at least at the time, though gamers were satiated after DLC was released to give them the closure they demanded. Dragon Age: Inquisition, Mass Effect: Andromeda, and Anthem have all proven to be similarly divisive. It's hard not to question whether BioWare is approaching something of a transitional period. It's clear that something needs to change in the creative process, but then this is a studio that has made rising to the occasion a part of its DNA. With Dragon Age 4 on the near horizon, we won't have long to wait to see whether BioWare is able to regain its composure and evolve the RPG genre all over again – just as it has done so many times across the last 24 years.